My father was a hard working man and my mother didn't drive. At the end of a long, hot summer day, the kids were all begging for a swim somewhere but Dad would have preferred just to put his feet up. Understandable. But once in a while, we prevailed and the station wagon was loaded up with the customary towels, buckets and shovels, the old plastic webbing type folding chairs and the bathing caps that I hated so much. What a joy it was to splash about in the cool lake water and then dig deep holes in the sand. We created some very elaborate sandcastles, surrounding them with long, snaking moats and topping the parapets with flags fashioned out of discarded drinking straws. The fun was eventually ended either by a wave of Dad's arm or by the beginning of a thunderstorm. We packed up and drove away feeling refreshed and just a bit hungry, and we all hoped that Dad would say the most magical words of all. "You don't want to stop here and get a hamburger, do you?" He always asked this question at the last minute, just as it looked like we were about to drive right past Dairy Queen. I tell you, to a bunch of soaking wet kids straight out of a lake, after an hour or two of fresh air and horseplay, these were the best burgers ever! Wet bathing suit, sandy feet and a charbroiled DQ hamburger eaten in the back of Pontiac Laurentian station wagon - what a great memory. So the answer to Dad's question, as if anyone doubted it, was always a very loud yes! Recently, I took advantage of Barrie's fantastic waterfront and took a dip in Kempenfelt Bay. One hot afternoon seemed like the perfect day. The white board at the life guard station read Welcome to Centennial Beach. Weather: Sunny 41 C. Water: 25 C. I waded into the sparkling water with two of my grown sons and we all agreed that it was a great day to be a citizen of Barrie. We took a moment to consider where the water's edge used to be (pre 1967) just below the new condominium towers, and to acknowledge the brilliant thinkers and planners who made this jewel their Centennial project. Centennial Park just keeps on getting better too. Have you checked out the new boardwalk? We stopped and ate a picnic lunch under a shady tree before our swim. Yes, yes, I know - Mom says no swimming for an hour after you eat! Our time in the lake was more splashing and floating than full-on swimming. Olympians we are not. After that, we decided to do something daring. Well, daring for me that is. I am a self-confessed chicken and never attempt anything remotely dangerous, but kayaking looked to me like something even I could do. So we took a walk down to the Happy Paddling boat and board rental trailer and signed up to give it a go. What a blast! The coolest (by any definition of the word) activity to do, in the scorching city of Barrie today, was to paddle a kayak straight through the mist of the Rotary Fountain at Centennial Park. How do you cap off a perfect summer day? 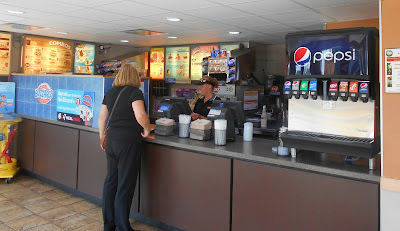 The same way as always, of course - with a visit to DQ. You would never know it, because she had a face-lift not long ago, but this Queen has been serving up goodies on the corner of Bradford and Vespra Streets since 1959. Everything from the counter and walls inside, to the signage, and the the painted yellow lines in the parking lot are freshly done and new. But the shop and parking lot are still as small as they ever were, which somehow seems nice to me. 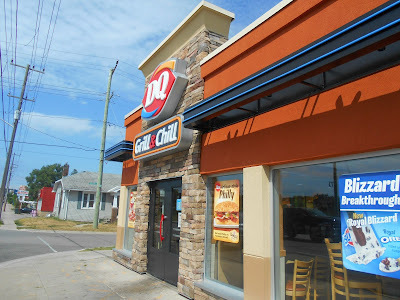 Maybe it is nostalgia talking, but to me nothing says says summer more than seeing the door of a DQ propped open to allow the queue of ice cream and burger seekers to spill out onto the sidewalk. So today, we each got a strawberry cheesecake Blizzard. Oh my stars, who invented this? What evil genius decided to combine little chunks of cheesecakey goodness with gooey-sweet strawberry syrup and swirl it into ice cream? We certainly savoured our little after beach treat here, as so many, many other Barrie folks have in the last 58 years in this place. 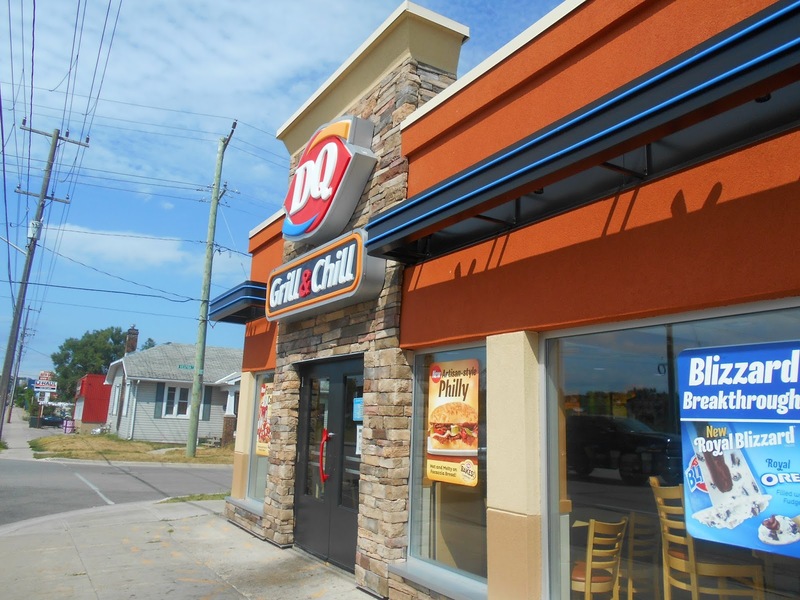 From those early days of banana splits and dipped cones, Dairy Queen seems to get better and better too. Remember when the Dennis the Menace gang were on all the DQ advertising, and by saying scrumpdillyishus would get you a 49 cent peanut buster parfait? Well, now you can even find poutine in Canadian DQs too. It would seem that the familiar favourites still remain while the new food items just cozy up to the old ones on the menu board. Sounds brilliant to me. 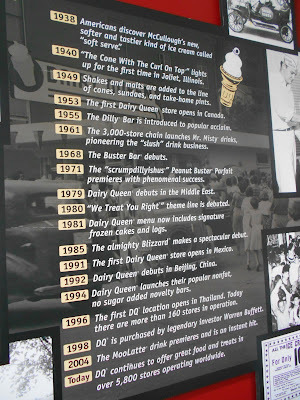 So tell me about your good memories, what yummy treat have brought you down to the DQ on Bradford Street over the years?